as i mentioned in my last post some of the aids memorial quilt panels are visiting cleveland - 128 panels to be exact - 64 panels are displayed at the cleveland institute of art and an equal number are displayed at metrohealth medical center. on friday i headed over to cia - as expected i was touched and of course so, so saddened. i was so moved on friday that i decided to see the rest of the panels on sunday - i didn't want to wait until the closing reception on wednesday when the space would most likely be filled with people. there is something profoundly sacred about viewing the panels when there are few, if any others around. for those who love factoids a few facts about the aids memorial quilt from a handout that i picked up. the handout was produced by the names project foundation. the quilt has been a ongoing visual tribute to those who died from aids since 1987. over 18 million people have visited the quilt and there are approximately 91,000 names on the quilt. the quilt weighs 54 tons and is 1,293,00 square feet. 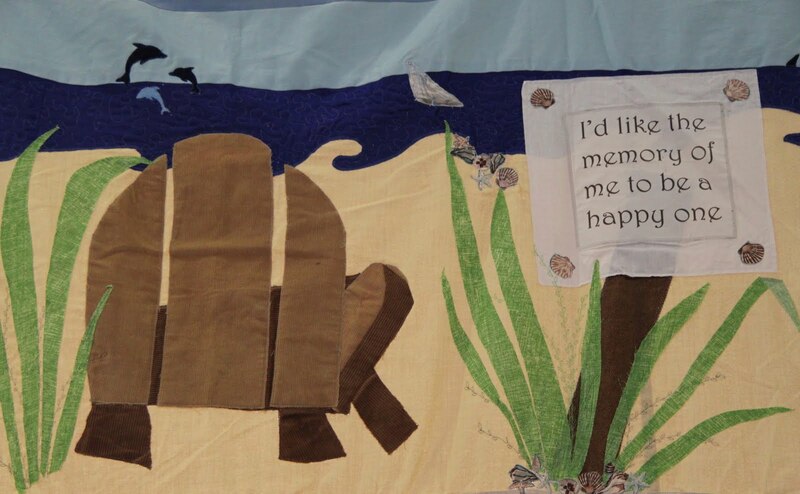 if one were to spend one minute with each panel, it would take 33 days to view the entire quilt. a panel is 3 feet by 6 feet and there are eight panels that make up each block to form a 12 foot by 12 foot section. the quilt still receives, on a average, a new panel each day. i'm thinking a good deal these days about loss and grief - which is not that unusual for this time of years. ironically the holiday season is one of those times when we are reminded, often painfully, of those who are no longer with us. I read "The Year of Magical Thinking" after my FIL died. I loved it. I love her. She's an amazing writer. She peels the layers of the onion away (as they say). "Cats"...saw it on Broadway about 3 mos after it opened. What a show. Such a moving post Mouse. I'm reminded of my friend Larry, who died of AIDS many years ago. Thank you for sharing this. I saw the exhibit a few years back in San Francisco. Next to the Vietnam Wall in D.C. it is the most moving tribute to the dead I've ever seen. Yes, so so sad. I'm sure that exhibit is amazing! And I've heard that book is excellent! What a moving post. I just found out that my second cousin is HIV positive. He was quit upset to come out with it at Thanksgiving but I wonder if it's because his sister and parents are upset about his being gay in the first place. I remember visiting the AIDS Quilt in the late 1980s, and even then, of course, it was huge. I had a "Names Project" t-shirt for many years. I loved "The Year of Magical Thinking," and I think I'd like to read "Blue Nights" as well. She's such a terrific writer.